Check out those glasses on the table. Look familiar? Oh, that’s right—I said realities. 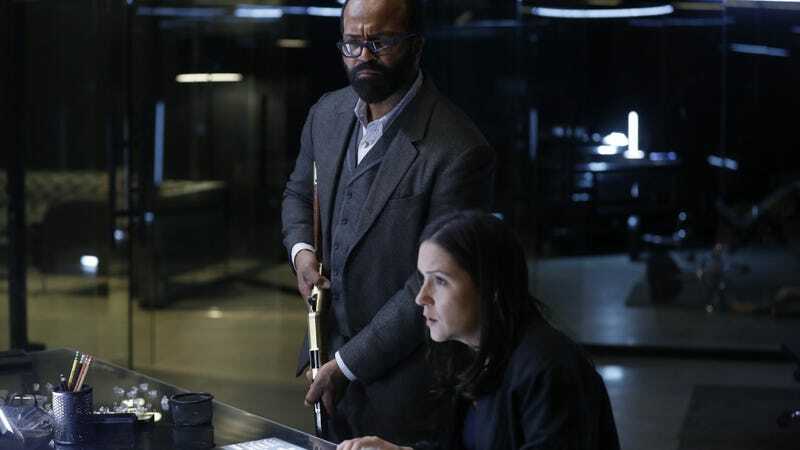 We may have gotten our first look inside Westworld’s Matrix-like simulation, but that might not be the only alternate reality out there. On the latest TheoryWorld, io9's Beth Elderkin and special guest Gizmodo video producer Eleanor Fye discuss a closed caption “error” that may point to a future reveal. Or not. Join the debate! Discussion points below. 1. We’ve learned that Robert Ford (Anthony Hopkins) is inside the Cradle! But why did he put himself there, and what is he up to? 2. Are the (non-Maeve) hosts sentient, or still under Ford’s control? 3. Does the Cradle’s use of “aspect ratio” disprove the theory that Bernard’s adventures with Karl Strand take place inside a simulation? 4. Is Bernard experiencing two time jumps with “Elsie,” with one of them being Charlotte retracing his steps? 5. Do you like all the time jumps, or are you getting sick of them?